Each house needs a space for changing, meant for the inhabitants and guests. It’d be proper to dedicate a room to this task. 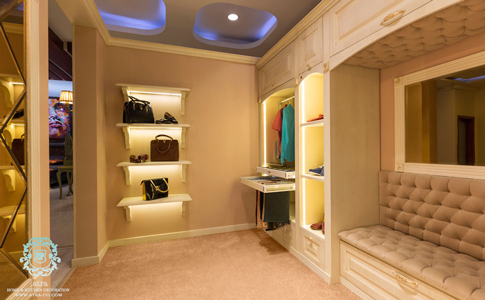 Closet room is a space the location of which is determined by the residents. For personal use it’s usually adjacent to the master bedroom, separated from it with glass doors or other ornamental doors, offering a nice place to prepare for daily activities. For the guest use, it is usually placed after the entrance zone so that the guests are able to go there at the time of entering and change in privacy. In this model a 2.5 in 2.5 space is dedicated to the closet room. This room includes closets for hanging tall clothing. Also drawers are equipped with smooth sliding fittings. Accessories are selected based on client need and desire. A number of accessories are the clothe hanger that can be brought down for ease of access, hanger for shawls and pants, modular shelf for ties and ornaments that is quite functional. 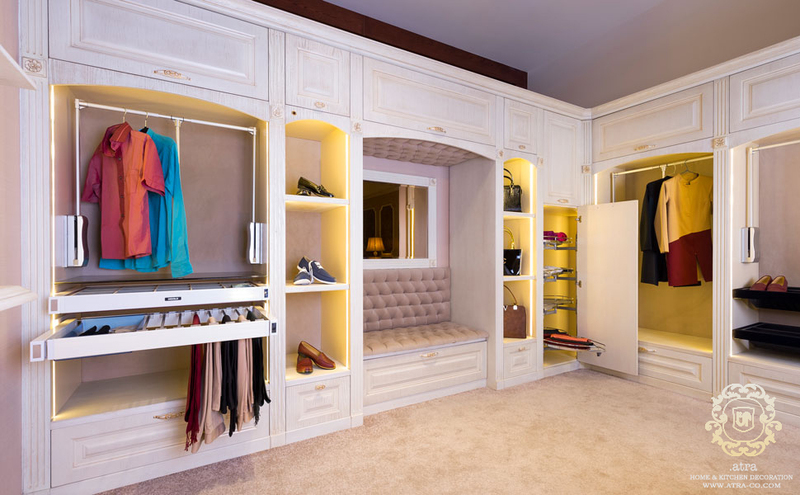 One of the accessories implemented in this closet is the corner is the reach-in accessory that enables access to otherwise wasted and inaccessible areas. The veneer is made of Alpi oak, and the color is Italian polyurethane with antibacterial and moisture resistance qualities. The engravings are of natural wood and handcrafted. Velvet is used for the covering of interior showcases and chairs to create a warm, peaceful space.